Over the years, we’ve all assumed that as long as we got our daily workout in, we were good for the day. However, all the newest research is showing that even IF we are getting in the currently recommended weekly exercise (2.5 hours of moderate-intensity cardio, or 75 minutes of high-intensity cardio, plus 2+ days of strength training), if we sit for the majority of the rest of the day, all that sitting basically negates the exercise we ARE getting. Sitting is the new smoking, and every movement in our day matters, and in a big way. So how do we squeeze in extra movement during our day spent sitting at a desk, at a conference table, in a car? Well, here’s 5 ways to start, and keep, moving. 1. On your way to work. Set your alarm 10 minutes earlier, throw on a sports bra, and do a quick (4-6 minutes) high-intensity workout at home; look on YouTube, the options are endless. Try walking or biking to work (if all the way from home is too far, drive part of the way and walk or bike the rest). At a minimum, park as far away from the office as possible, and take the stairs whenever possible. 2. When doing tasks. Multitask during those autopilot moments by adding some exercise. The easiest is to flex and squeeze various body parts. 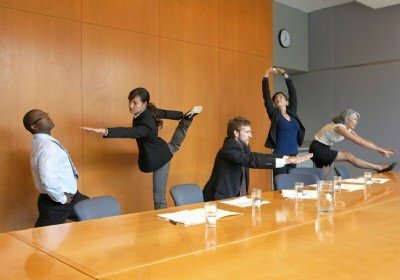 From your glutes and abs to your pecs and thighs, flex your way through a long meeting. Step it up a notch by doing some squats when you’re on the phone (stand up and sit down 5 times every time the phone rings), or leg lifts while seated. Get a standing desk, or use a tall counter or table for part of the day. They even make nifty devices that convert your standard height desk into a standing surface and back again so you can use your current desk both ways. 3. Every time you finish a task. When you first get to work, make a to-do list. Every time you cross off an item, reward yourself with movement. That could be a couple quick laps around the office, standing up and doing a couple stretches, closing your office door and knocking out a dozen push-ups from the edge of your desk. Set a reward at the beginning of each day so you don’t even have to decide what to do each time you cross an item off the list and get it done! 4. When you need to communicate. As helpful as email might be, when possible communicate in face with your co-workers by getting up and walking to them. We discussed phone calls before – but what if you had a stand, dance or prance option in place for any time you were on the phone? 5. At the top of the hour. If you set an alarm on your phone and get up and move your whole body for 5 minutes 8 times a day, you’ll probably burn around 80 calories a day. That’s 400 calories a week, 1600 a month, 20,000 a year (even with 2 weeks off). That’s the equivalent of 8 pounds, by the way. Do you have an “Every Movement Matters” tip? Share it here (in the comments) so everyone can benefit from it. Remember these tips still need to be in addition to the current exercise recommendations, so keep (or start) coming to class often. 30 minutes a day, 5 days a week will get you those recommendations. Hey, I just happen to offer 30-minute classes 5 days a week (and now you know why I scheduled them like that). Or, 3 Zumba classes a week gets you there and then some. I won’t even take it personally if work out with me just 1-2 times a week and somewhere else the rest of the time. Just get the time in – the longer blocks, AND the shorter little bursts that add up so importantly!